By the folk who finger-flick. That would make your rabbit sick. There were six of us passing magic stories around the campfire that night in the deep woods of the Yukon River Valley -- ancient convention stories, dark tales of the Northern Peaks. Finally Old Jake knocked the ashes out of his pipe and said quietly, "I guess it's my turn to tell one now, eh? Boys, did you ever hear the true story of Shawn Farquhar and the GWB?" We shook our heads. The Klondike Kid looked puzzled. "What's a GWB?" Jake replied, "I guess you ain't been out here long enough to know -- but it's time you did, for your own good, eh? The GWB is the Great White Bear of the North. It's an ice-bear, biggest there ever was, so big its paw prints are ponds, so big it can swallow an orca in one gulp, so cold it brings winter with it where-ever it goes, eh? It's old, nobody knows how old, and it roams across the Arctic, always hunting." "For hack magicians, Kid -- magicians who have no respect for the art. Anyways, this is the story of how the Great White Bear came to FFFF in 2014. It started like this." He took a long pull on the jug, stared into the fire, and began his tale. "It was near the end of April. I was mushing my dog-team southward and I was in a hurry. It's a long trail from Hudson's Bay to New York State and I was late starting out. I had my invite in my poke: a scrap of birchbark with "FFFF" burned on it. I found it lying beside my igloo one morning, and I knew it was Obie O'Brien's way of inviting me to Batavia for Obie's FFFF, the Original Close Up Convention. "Now you boys may recall that winter -- it was the coldest since the Deep Freeze of 1998. The whole world was in the grip of a polar vortex, eh? When I got to Thunder Bay I found the Great Lakes were frozen solid, and the current that drains them had left a deep curving groove right down the middle -- it was the world's longest bobsled run. I got my huskies up to a gallop and steered them in -- it was so slick we slid all the way from Thunder Bay to Batavia -- the only time the dogs complained was when we went over Niagara Falls. "The snow was at least 80 feet deep in Batavia but I could hear cards being shuffled somewhere underneath so I started digging. On April 23 I reached ground level just in time for the first event of the convention. 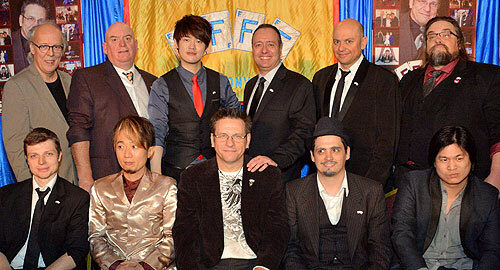 The first-ever Wednesday night FFFF Gala Show was on. "Sitting in the stands were 230 of the wildest, hairiest, meanest, craziest close-up magicians in the world. The hooting and hollering was deafening but Obie's famous whistle cut through like the scream of a mountain-lion. He introduced Joe "Tuktoyaktuk" Turner to MC the show, and Joe got things rolling by bringing on Guest of Honour Shawn Farquhar, the roughest, toughest double FISM champion of them all. Shawn started with Smarties, continued with an awesome book test, and finished with his award-winning cups and balls routine. Next up was Yumi, performing charming traditional Japanese magic with O-wan To Tama (cups and balls). Then Tango did a super clean version of ACAAN. Next James Jien did an amazing transposition effect with Aces and Jacks. Will Gray produced a live salmon from the sleeve of someone else's jacket. Christian and Katalina re-enacted a dinner with the Borgias involving fine food and deadly poison. Wladimir did whimsical, sophisticated magic with rope. Mike Chao closed the show with his sublime "green" act of productions and manipulation. The Kid interrupted with "A salmon?" Old Jake looked at him steadily. "Some say it was a goldfish... but I say it was a salmon. You wish to dispute the point?" The Kid said nothing. Old Jake resumed his story. "Some time around then the temperature started to drop. A couple of guys started talking about the polar vortex, but I knew what it really was. I'd seen the signs -- it was the Great White Bear approaching, dragging a cold front with it. I knew right then that we were in big trouble. "Later that night we got back together for a lecture from Bruno Copin. It was incredible -- he had things flying and jumping and flipping over like they were alive. Then it was off to the campfires for a long night of yarning and magic-swapping -- see, Kid, FFFF is like that: it's all about the sharing, eh? "As the night went on it got colder and colder. When I finally went to bed I slept between blocks of ice just for the insulation. Around 4 AM I woke up to the sound of screaming -- I ran outside and found a single bitten-up Seven of Diamonds. A quick role-call revealed we were missing the guy who had forced the same card nine times on his volunteer. I knew the Great White had struck. "After that, things were pretty quiet until 11 AM when Obie started tooting his whistle again. It was still getting colder -- big chunks of puffy ice started falling from clouds that had frozen solid overnight. I rolled out of my blanket, swigged a gallon of boiling coffee straight from the pot, and settled down for a lecture from Tim Ellis. Tim started by eating razorblades, then showed us something he must have learned out in the tall pines: how to handle a wolf-trap safely… except it didn't go so well for his hand. He talked mostly about how to make the audience care about your performance. He made some really wise observations about the difference between "magic concerts" and "magic theatre." Important stuff, Kid. "After lunch we had the Kick-Off Show, MC-ed by Steve "Lost in the Barrens" Beam. First up, Joel Greenwich predicted the exact number of cards a volunteer would deal. Then William Watt made magic with a ribbon and a borrowed ring. Tyler Erickson made some coins travel magically into a volunteer's hand. Davio Wu made magic with LEGO bricks -- I never saw that before, eh? 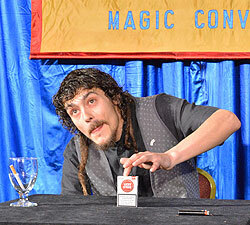 Next, Riccardo Negroni put away his coins and made great magic with cards. Daly did clever magic with coins and bills. Eric Roumestan made coin magic happen in the hands of my old trail-buddy Mike Hrab. Then Clemens Ilgner made the tastes of two soft drinks trade places. Closing out the show was Michael Dardant… only he looked and sounded just like Shawn Farquhar (and was almost as adorable). His spot-on characterization brought that hard-bitten crowd to its feet in a standing ovation. "It was about that time that the Great White struck again. At lunch we had all heard a guy say "Oh, that was the clean one". Just before dinner we found his top hat, chewed to shreds, and no sign of him. 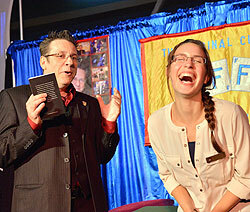 "The next show was called "Familiar Faces," and the MC was Gary "Medicine Hat" Morton. The first performer was Mike "Six" Muldoon, who showed an amazing rendition of Triumph. Then Bruce Kalver told a moving story about his ancestors -- while pictures of them materialized inside an empty box. Ice McDonald was able to name the cards in separate parts of a shuffled deck. There was a change of pace as Xavier Belmont demonstrated the use of muscle reading to find a chosen card. Vinny Grosso had the strange ability to identify cards by taste. Brian Roberts performed an astonishingly visual two card transposition routine, eh? Roy Eidem magically produced coins from the frame of a purse. The final performer was David Corsaro, who magically transformed into Dai Vernon to deliver pungent opinions on Shawn Farquhar and everyone else. "We took a break to eat -- the hotel restaurant was serving poutine and beaver-tails -- beauty, eh? -- then sat down for the Shawn Farquhar lecture. Shawn taught the book test he had performed earlier and some really clever magic using credit cards and hotel key cards. Then he taught us the workings of his excellent card to wallet and his brilliant torn-and-kind-of-restored signed photograph. It was an outstanding lecture from a world-class magician, eh? "After the lecture we noticed the cold was closing in even more, and I knew the Great White was still hunting. It was so cold there were two hound dogs putting jumper cables on a rabbit so they could start it up and chase it. "That night I sat around campfires with John Bannon, Raj Madhok, Alan Zola Kronzek and others. The magic was flying thick and fast -- smart, original, powerful magic, the kind that may come up from the underground some day. Later I saw Riccardo Negroni and Tony Polli make coins fly through the air, vanish and reappear in ways I had never seen before. "The next day started with Mike "Pemmican" Powers MC-ing the Pat Page Memorial Workshop -- always one of my favourite parts of FFFF. This year the theme was "Magic that was published at least 50 years ago." Mike led off the teaching with an excellent poker routine from Stewart James in Print. Then Peter McLanachan taught us a variation of Charlie Miller's "Dunbury Delusion" from Expert Card Technique. David Neighbours shared a very visual coins through the table routine from the Bobo book. Steve Friedberg mixed card magic with the true history of Kid Canfield, a reformed gambler. Next, Bruce Kalver and Joan Caesar taught us a 2-person code system that has been in Bruce's family for generations. Gene Gordon shared a clever bill transposition effect from Tarbell Volume 3. Tony Gerard taught his excellent version of a trick by Annemann called "One in Fourteen," which first appeared in The Linking Ring in 1927. 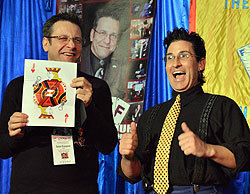 Tom Craven taught one of my favourite coin routines, the "Sympathetic Coins" from The Fine Art of Magic. "There were three shows that day, and the Great White struck three times. "The first show was MC-ed by Buddy "Frobisher Bay" Farnan. He introduced Eric DeCamps, who made 10 cards travel up his sleeve one by one. Yuri Kaine was up next, with an Ace Transposition routine. Hae-suk Oh followed with an extremely clean-looking coins-across effect. Rémy Robert was whimsical and funny with his torn-and-restored cookie routine. Mario Lopez, who might be the reincarnation of Doug Henning, did an hilarious act with cigarettes that brought us to our feet in a standing ovation. Tim Ellis performed a baffling version of ACAAN then did his famous "Run-Around Sue" cups and balls act. Rune Carlson made a sequence of increasingly impossible predictions, all of which were correct. Tony Montana predicted the order in which a set of scarves would be tied. Eric Jones closed the show with elegant and graceful coin magic. "Just then there was a huge roaring noise out in the parking lot. We ran outside -- there were deep claw-scratches in the walls, and a hotel security guard told us he had just heard someone say the fatal words "What, I'm not one of your friends?" We all knew the Great White had claimed another hack magician. "The next show had Oscar "Moosejaw" Muñoz as MC. First up was Daryl Rose, who played a terrifying game of Russian Roulette with a balloon gun. Next Wayne Anderson bent some silverware with the power of his mind. Will Fern magically transported coins under a napkin that jumped when each one arrived. Then Mirko Ferrantini borrowed a deck of cards and cut to the four Aces. Karl Hein transformed plain paper into real money. 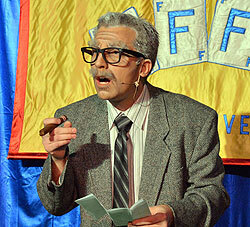 Next Chris Pilsworth did a funny and theatrical rendition of the cut-and-restored fabric. 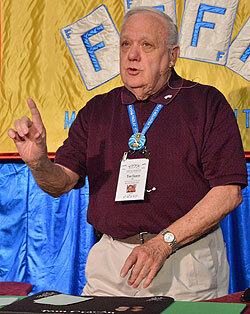 Howard Hamburg spoke movingly of what magic has given him, and performed powerful card magic. Then Gérald Mainart performed an excellent version of Twisting the Aces. 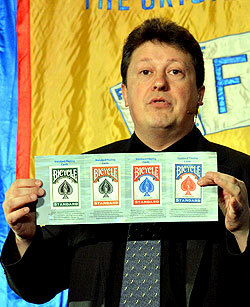 David Regal closed the show with an incredible transposition of two cards between two decks held by two people. "After the show we realized nobody had seen the "Oh, you're happy with the mind you have?" guy since before lunch… we never did see him again, and to be honest we never looked too hard. The Great White got him and that was ok with us. "The evening show was introduced by Meir "Yellowknife" Yedid. He showed us a Youtube video Matt Episcopo had made earlier in the day -- you can find it at http://tinyurl.com/kwbtzvl. Then Andost started off the magic by predicting three selected cards, including the colours of their backs. Ludovic Juillot performed strong coin magic in the persona of Don Corleone. Next Hannibal presented a beautiful and poignant act combining stories and magic. Then Jaque earned a standing ovation with an act that included poker chips, dice and whisky. Shimpei Katsuragawa spread his cards out like piano keys and performed music-themed magic with them. 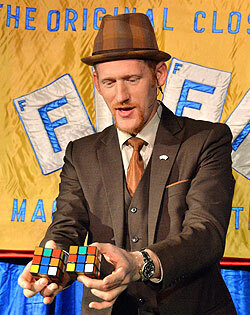 "After a short recess Garret Thomas performed magic with a Rubik's Cube and with finger rings, and got a standing ovation. Then Seol Park did high-speed magic while an instruction-tape played at "fast forward" speed -- he also received a standing ovation. Martin Cox, the Hard Man of Magic, balanced an egg on a tray on a glass on Shawn Farquhar's head then knocked away the tray. Bruno Copin transported a signed postcard into a sealed envelope. 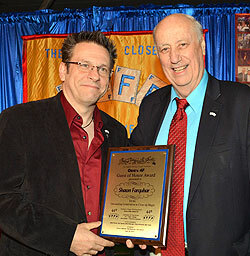 The show closer was Pierric Tenthorey, who humorously exploited the time-limit on FFFF acts by cutting straight to the conclusions of all his effects. The audience loved it and rewarded him with a standing ovation. "We thought maybe the Great White was sated, but the temperature was still dropping. Down in the hotel kitchen the bubbles froze in a pot of boiling water. I saw some guy cascade a deck of cards and they froze stiff in mid-air. We had to walk around them for the rest of the night. 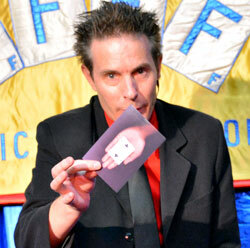 "Late that night I saw my old buddy Ray Roch performing his "Impossible Box" routine -- it's amazing! He built a little box out of six playing cards, then produced objects out of it over and over. It was a huge hit with the gang around the fire. "Saturday started with a lecture by Henry Evans, the world's happiest magician. He started by making his watch jump into a knot in a piece of rope -- it was incredibly visual and magical! He continued with outstanding magic using cards, coins, faux hypnotism, and paper currency. This was smart, practical, cutting-edge magic, beautifully conceived and executed. "The first show of the day was managed by MC Pattrick "Petawawa" Przysiecki. First up was Jimmy C, who surprised us all by bringing back Jay Marshall's friend Lefty. Next Shank Kothare and Ed Ripley delivered a clever act based on the idea of outsourcing magic. Jérôme Bourgeon showed how a card shark might find a chosen card, by bringing on an actual flying shark! Then Hayafumi combined the values of two chosen cards in four different ways to find relevant cards in the deck. Hayafumi's magic is always original and unique. Kirk Patrick followed up by making a volunteer into a magician. Funny thing is the volunteer was Boris Wild, who is already a great magician! The next act consisted of all the women at FFFF working together to cut Shawn Farquhar in half with a power saw. The stage wasn't exactly crowded -- there were only five women there: Mandy Farrell, Yumi, Katalina Absolon, Maria Schweiter and Joan Caesar. Then Roger Nicot did an amazing four-way prediction using a numbered deck – this was one of the most puzzling things I saw at FFFF. 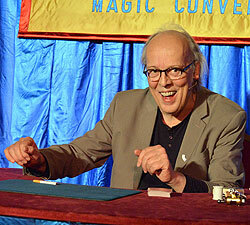 Auke van Dokkum performed graceful coin magic that was a joy to watch. Bob Swadling presented a humorous tribute to Tommy Cooper. Hide Kimoto ended the show with a beautiful rendition of the Linking Rings using small rings. "Suddenly the temperature dropped faster than Hank Lee's reputation. It was so cold the flames froze on my multiplying candles -- I used them as reading lights for the rest of the week. Everyone went silent, and we heard a single voice from the lobby "Defacing a dollar bill… you just committed a felony… AAAAGH!" and we knew the Great White had thinned the herd again. "For the next show the MC was Dan "Haida Gwai" Garrett. Dan introduced Alain Ianonne who performed a card stab routine using William Watts' back as the table. Then Bill Evans called upon the power of bacon to work his magic. Ouka was next with an exciting yo-yo act that looked very dangerous -- he earned a standing ovation, eh? Joe Monti followed that with one of the funniest 3-card monte routines I have ever seen. Mike Maione used a tin-can telephone to transmit a card from one person to another. Then Derick Finn performed a powerful version of the Christ Aces. Michael Kaminskas was next, with a torn and restored Skittles bag that really caught everyone's attention. Then Keith Fields performed his trademark hat juggling and an excellent cup and ball routine. Geoff Williams ended the show with a great moving-hole effect. "Cold, cold, colder it got, and colder still. I stepped outside and my shadow froze to the ground -- I'll show you tomorrow that I don't have one. By this time we were all looking over our shoulders every time anyone did a trick, but there was no sign of the Great White. I knew he was out there though, just biding his time. "Far too soon, it was time for the last event of the Frolic: the Grand Finale Show. Obie O'Brien did the MC duties. After a number of awards and presentations to Shawn Farquhar and another very funny video by Matt Episcopo, the magic began. First Albert Lorenzo did a beautiful cups and balls routine using dice of many sizes, and received a standing ovation. Then Bébel presented his incredible, astonishing card magic. Next Soma did something astounding and completely unique: he composed and recorded a song right before our eyes, using the sounds of magic (riffling cards, clinking coins, etc.) on a looping recorder to build the music piece by piece. When he finished the crowd rose in a loud ovation. Then Rocco took the stage and filled it as only he can with intensely magical productions and transformations. Somehow smoke, rice, milk, ice cream, pretzels, eggs and many other things became part of an unbroken magical experience. We gave him a big standing ovation. "After a short break where everyone went to walk their huskies, Angel San Martin did what I can only call Cups and Balls+++, involving not only cups and balls but his hat, shoes, vest and tie. He was rewarded with a standing ovation. Then Ouka returned to the stage and performed his unbelievable 8-ring contact juggling act, and received a HUGE ovation. Jay Scott Berry followed up with open-hand productions: coins, bills and balls appeared from thin air with no cover -- incredibly visual magic. Henry Evans, still happier than anyone else in the world, was the last magical performer: he did jaw-dropping magic with four borrowed and shuffled decks -- when he finished there was an instant standing ovation. There was a slight pause in the show so that Obie could announce the MVP, as voted by us: Michael Dardant was the happy recipient and we gave him a standing ovation. Then, closing the show as they have for several years, Steve Bargatze and Rick Merrill gave their sharp-witted observations on the whole convention. They were dead-on and merciless, and when they finished we sent them off with a standing ovation. "And then … it started to get really cold. First the beams of light in the room froze -- they fell to the floor like long, glowing threads. Then it got colder than Ozzie Osbourne's welcome at a PETA rally. Then it got colder than a booking agent's heart. And then…"
Old Jake's voice dropped in pitch. "Then the Great White came slowly through the door. None of us could move. The Bear swung his huge head from side to side, and every magician in the room regretted ever using those tired old stock lines we've all heard too often. Finally the Great White Bear took one mighty step towards Shawn Farquhar and opened its jaws wide. "Oh no," said Shawn. "Earlier today I said 'I'm not psychic, I'm psychotic'. I'm doomed!" The Great White Bear snatched Shawn up in its terrible teeth and started to chew. With one voice we all shouted, "No! Nooo! It's ok, because he's ADORABLE!!" "And the Great White let him go. It just set him down on his chair, glared one more time around the room, and shuffled out the door. Shawn was a little mangled but none the worse for wear. You can bet we partied all night long after that, and there was not a hackneyed, stock patter line to be heard anywhere. Every one of the magicians at FFFF had learned the danger. When we finally said our farewells we all took home something very important -- something to hold onto." "And the Great White Bear?" whispered the Kid. Old Jake's voice got real soft. "Oh he's out there son... still hunting. Some say he'll never stop. He was seen last month up near Lake Athabasca. And if you've ever stolen a line or a trick from someone else he'll track you down, and then, some night, when you least expect it, you'll hear a soft breath behind you and then..."
Well that was me, having left my seat and snuck up behind the Klondike Kid. See, Old Jake has told this story a hundred times -- except for the Kid, we had all heard it before -- and it was my turn to play the GWB. We laughed ourselves silly. And the Kid? He launched himself over the fire like a jet-plane off the deck of an aircraft carrier. For all I know, he hasn't touched down yet.